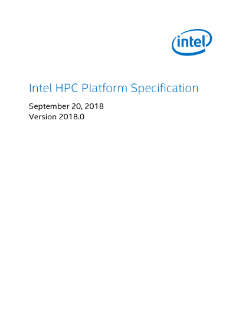 We are pleased to announce the name change of our platform specification from Intel® Scalable System Framework (Intel® SSF) Platform Specification to Intel HPC Platform Specification. This renaming has occurred to better align with Intel’s direction with Intel® Select Solutions. The Intel HPC Platform Specification establishes the fundamental requirements for all Intel® Select Solutions for HPC and associated workloads. Intel® Scalable System Framework packages for RPM-based Linux* OS Distributions. Intel® SSF establishes the fundamental requirements for all Intel® Select Solutions for HPC and associated workloads.